My name is Heather and this is my first post, but certainly not the first time I feel close to all of you. Someone sent me the link to Phoe just a few days after she was born and just as others have said, she became part of my day ... my first good morning and my last good night. And in the past few weeks as we all prepared for her to fly into the wild blue yonder, I clicked and clicked on the cam and the chat throughout the day ... waiting and looking forward. So now she has flown to the wild blue yonder, just not the one we hoped for her. I miss her more than I thought possible, but after 2 days I realize it's not just Phoe I miss ... I miss the sanctuary of what was Phoe, I miss those moments when except for all of you sharing the same joyful moments, the rest of the world did not exist. It was peace, joy and love. And I ache to feel that again and with God's grace, it will. And just this morning I asked myself .... if I had known it would end like this, would I still have watched, would I still have let myself get so caught up in the lives of these wonderful eagles, would I still have fallen so desperately in love with our sweet Phoe. And I realized that yes, I would. I would do it all again even if I knew. Because Phoe and her parents and all of those who loved her added a new dimension to my life, one I had never known, and these months will stay in my heart forever. McMolly - How beautiful. Simply beautiful. Remember when Phoenix snuggled up under Mom's warm feathers? I live in MA and started watching Phoenix and his family a week or 2 after she hatched. A friend sent me the link to the site. Phoe was a determined and funny little eaglet and her parents took such good care of her. And she was a character - with her little whining for food, figuring out how to use those wings that she had to grow into, playing with sticks, and it was so cute when she was kept nice and warm under her mom, with just her head sticking out. But when Phoe was older, Mom couldn't get all of Phoe under her, so she would just cover her head! I had the webcam on all the time so I could see what was happening. This webcam was so cool with the sound and the close-up cam! Thank you Doug! I watched a webcam in Oklahoma last year and it would have been cool if there was sound. 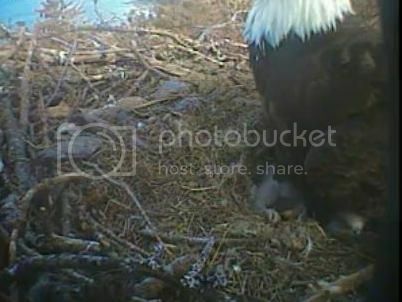 The eagles successfully raised their eaglet! This year, those eagles nested in an old hawk nest which was very small. 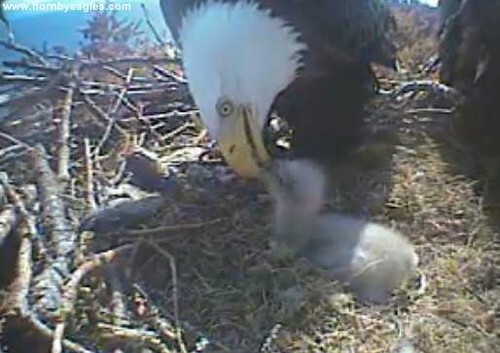 It was very sad when that eaglet fell out of the nest. 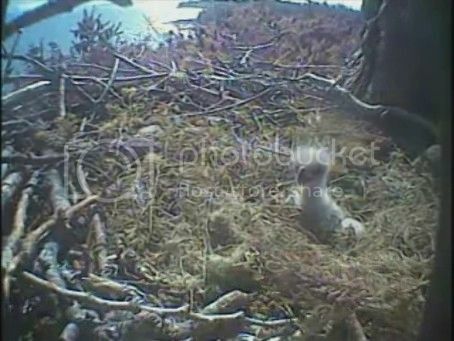 It feels weird looking at the empty next now - I feel like something is missing, no knocking sounds coming from the nest. But I'll be back next year to watch. they said because Phoenix's death was caused by an infectious disease, sadly, she cannot be returned to Hornby Island for interment. why could the body not be creamated and then buried on Hornby Island? Because the officials said she couldn't. i remember seeing mention of a few videos of Phoenix's life here, but was on my iphone at the time and couldn't view them. Can someone find them and post them here? And the dear friends have to part? With a wish that is kind and true. The soul of a friend we've made. The last clip in the video was recorded on July 12. Upright and Sunbathing. The noise in the background is the well driver at nearby house. It been a wet and windy day. Mum looks bedraggled. It was 6:51 pm and windy. Mum had Phoenix pinned down by the wing. And Midshipman fish were obviously in abundance.